Comprehensive Vision Exams and so much more! 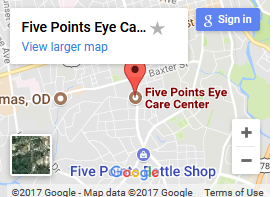 Five Points Eye Care offers the full spectrum of eye care to clients of all ages, from children to older adults: vision and eye health evaluations, immediate attention for eye emergencies, low vision rehabilitation, pediatric and vision therapy services, orthokeratology/corneal refractive therapy and specialty contact lens fittings. We use the most up-to-date technology to ensure the best eye care possible. Learn about the different types of tests and equipment you may experience on a visit to Five Points Eye Care. Low vision is defined as insufficient vision to be able to do the things you want to do. Dr. Jon Forché is the only residency-trained low vision rehabilitation specialist in the Athens area.